After a 94-year hiatus, cross country returned to the Olympic arena on Monday (15) at the Buenos Aires 2018 Youth Olympic Games. 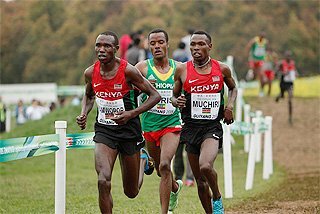 It was worth the wait, as Kenya’s Jackson Muema out-duelled Ethiopia’s Berihu Aregawi in the boys’ race, while in the girls’ event, Uganda’s Sarah Chelangat reeled early-spurting Edinah Jebitok of Kenya to break the tape. 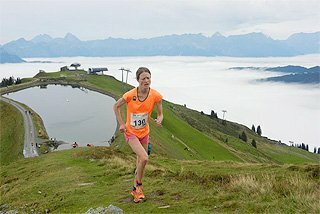 The morning 4km races represented the second stage of the 1500m, 3000m and 2000m steeplechase, with combined rankings determining the individual medallists. Muema’s one-second stage win over Aregawi was crucial. Uganda’s Oscar Chelimo came home third, reversing the top three from the track 3000m last week. It left the three athletes finished tied on four points, meaning the cross country finishes decided the medals. 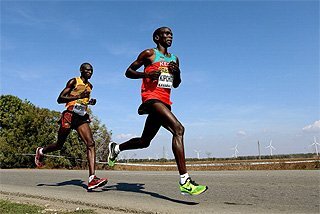 And so it was that Kenyan Muema clinched the gold ahead of Ethiopia’s Aregawi, while Chelimo took bronze. It was the same story for deciding the men's 1500m medallists, as once again the top three were reversed to leave a three-way, four-point tie. But the gold was Jean de Dieu Butoyi's, the Burundian the first home of the metric milers to move up from third after last week’s track race. Morocco's Anass Essayi retained his silver medal position, while Ethiopia's Melese Nberet ended with the bronze after a gallant seventh-place overall finish. As for Chelangat, the win confirmed the Ugandan as the gold medallist for the women’s 3000m, the first stage of which she had won on the track last Thursday. There was no movement in the medal places behind her, either, as Kenya’s Mercy Chepkorir came home fourth overall and second of the 3000m runners for silver, while Ethiopia’s Aberash Minsewo crossed sixth, third in her discipline, to wrap up bronze. While Jebitok couldn’t hold on for the cross country win, her bold running was rewarded with that second-place finish, and meant the Kenyan clinched the 1500m gold after running fastest on the track last Friday. Australia’s Jaylah Hancock-Cameron, second on the track, was the fourth home of the athletes in her event. 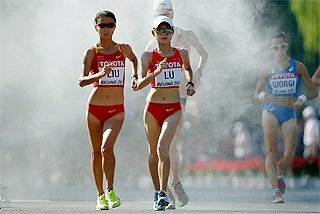 It meant she retained her silver medal position by a single point ahead of Lemlem Hailu, who tied on points with Japan's Yuki Kanemitsu, but clinched bronze thanks to finishing second of the 1500m runners. There was no change in the top three in the women’s steeplechase standings, as Fancy Cherono of Kenya came through third overall for her second stage win to secure the gold. 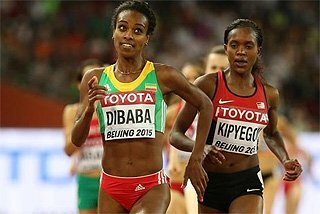 Ethiopia’s Mekides Abebe was 11th overall, third of the steeplechasers, to get silver; Sri Lanka’s Parami Wasanthi Maristela’s carried her bronze medal position through to the finish, finishing fourth in her event and 17th overall on the turf. Abrham Sime also claimed his second stage win, coming home ninth overall, to clinch the men’s steeplechase gold for Ethiopia. 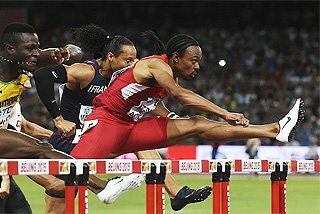 The medal excitement in that event took place mid-pack, as France’s Baptiste Guyon toiled fruitfully, finishing 11th overall to come home as the second placed steeplechaser, enough to move from sixth to earn silver. Fifth place track man Abel Yamane of Eritrea was the third steeplechaser through, meaning he took bronze. Complex? Sure. But that mattered little to the thousands who lined the tight, twisting 800-metre loop squeezed in the centre of Youth Olympic Park. This nostalgic innovation delivered two fantastic races. The spectators’ vociferous verdict: a hit. Sprinters like it hot, and with the temperature dial budging 30C at Youth Olympic Park, both the men’s and women’s 100m races saw the champions crowned with top times, even though the tailwind scuppered their record eligibility. You have to admire Rosemary Chukwuma’s nerves. Coming into the second stage of the women’s short sprint third overall, the Nigerian – who entered the Games as the fastest in the field – was trailing through the first 50 metres of the women’s 100m. 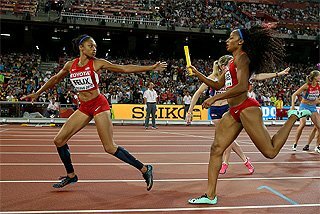 The pressure didn’t show, as she held her top end speed the best to edge away and win in 11.17, a time that would have been a Games record were it not for the 3.3m/s wind. St Lucia’s Julien Alfred crossed second in 11.23 to retain her silver medal position, missing gold by just 0.02. 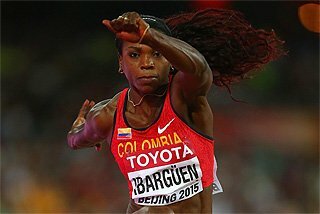 Ecuador’s Gabriela Suarez was third in 11.29, dropping from first, but still earning bronze. The top three remained unaltered from stage one in the men’s 100m, as South Africa’s Luke Davids sealed gold with the win in 10.15 (3.4m/s) – again inside the previous Games record, but again not eligible for the books. Fastest in the rain last week, he was swiftest in the sun, as he held off the mid-section charge of Nigeria’s Alaba Olukunle Akintola, pumping his chest in celebration as he crossed the line. “All the hard work, those early nights, the sacrifice was worth it!” beamed Davids. Akintola was pleased with silver, offering buoyant congratulations to the winner. The more demure Seiryo Ikeda earned bronze for Japan with a 10.82 clocking. Oscar Patin collected the gold in the men’s 5000m race walk. The Ecuadorian led after the first stage, and though he crossed third in today’s race in 20:38.17, he moved to second following the disqualification of initial winner Xin Wang for a lane infringement. Suraj Panwar was therefore given the stage win, meaning silver for the Indian after finishing second last Thursday. Puerto Rico’s Jan Moreu finished third and earned bronze. Tasew Yada wrapped up 800m gold courtesy of his two-stage win. The Ethiopian, the fastest in Friday's opener, again showed fine closing speed to stop the clock in 1:50.38. Despite finishing sixth on the day, Algeria’s Mohamed Ali Gouaned stayed close enough by time (1:51.66) to earn silver after he had finished second overall in the opening stage. 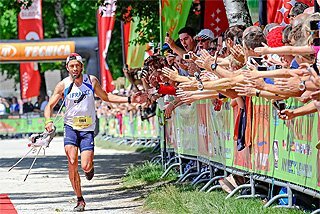 Mehmet Celik of Turkey finished second in 1:51.66 to remain in third position overall and collect bronze. Argentina’s Nazareno Sasia got the biggest cheer of the day after his shot put gold medal was confirmed. As in the first stage, he was in imperious form. An unfussy thrower, he sent three of his four efforts beyond the 21-metre line, topping out with 21.25m. “My throw in the first stage was better, but today was still a beautiful competition,” said the most in-demand man in the media area. China’s Xing Jialiang finished with the silver medal after unleashing a personal best of 20.89m in round three to move up from third. Italy's Carmelo Alessandro Musci (20.76m) improved by 10 centimetres on his first-round result to move from fourth to grab bronze. There was gold for China in the women’s shot put, as the U18 world leader Li Xinhui retained her No.1 position from the first stage with a best of 18.33m. Yelizaveta Dorts of Belarus held out in silver medal position with 17.53m, while South Africa’s Dane Roets claimed bronze with 17.34m. 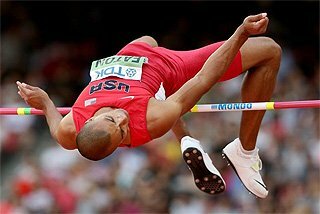 Lester Alcides Lescay Gay upheld Cuba’s strong jumping pedigree by leapfrogging Joshua Cowley to nab long jump gold. Australia’s Cowley had led after the first stage with 7.71m, and although he improved on that mark with a wind-legal PB of 7.82m, he couldn’t respond after Gay flew out to 7.89m (4.3m/s) to win by a single centimetre in the combined standings. 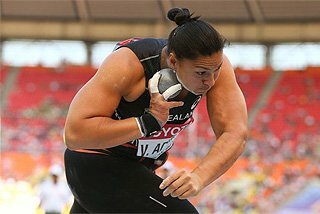 Japan’s Wada Joki bumped from fourth to bronze after a last-round 7.66m (2.8m/s). Yaroslava Mahuchikh scored her second Games record of the week on her way to winning high jump gold. The Ukrainian cleared first time up to a personal best 1.95m for a convincing win over neutral athlete Mariya Kochanova, who cleared a PB of 1.87m. Elizabeth Moss bagged bronze ahead of Jessica Kahara, the Australian clearing first time at 1.82m to see off the Finn, who made the height at the second attempt. In the girls' hammer, Valeriya Ivanenko eased to gold with a combined winning margin of more than 10 metres. As in the first stage, the Ukrainian was the only girl to throw beyond 70 metres with a best of 72.08m. Egypt's Rawan Ayman Ibrahim Barakat threw 66.50m to finish second, as she did in the first stage, and secure silver. Cuba’s Alegna Osorio Mayari’s consistency over the two stages (63.69m and 63.31m) proved enough for bronze. The third of Ukraine’s gold medals came via Mykhaylo Kokhan in the boys’ hammer. 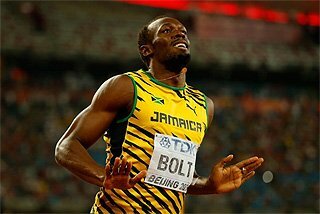 He had led after stage one and made no doubt of the title by throwing 85.14m in round three. It was as-they-were behind him, with Bulgaria’s Valentin Andreev throwing 81.67m to secure silver, and China’s Wang Qi finding 75.90m for bronze.